An abandoned surface mine near Hernshaw in Kanawha County is now a site for growing and harvesting lavender plants, with a goal of putting veterans and coal miners back to work. “They give me a list of things to do, and I get them done,” former coal miner Donnie Facemyer said. Facemyer is a laid off coal miner, now back to work at the surface mine but with a whole new job description. “It’s different, but it’s nice being back here on the mountain,” Facemyer said. Four Mile Mountain, once a Pritchard surface mine, is now reclaimed as a lavender farm. “Put a little compost in the hole, bust the root clot up so it will take root a little better, and plant your lavender bush,” Facemyer said. Click here to view Gunderson’s news report. The Green Mining Model Business Program started the farm with a Benedum Foundation grant of $210,000 to first test out the land. “So we know what will grow up here, what won’t grow up here, what will produce oil and what won’t produce oil,” Project Coordinator Marina Sawyer said. 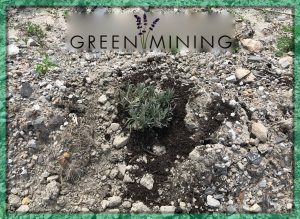 With the rocky, sandy soil from the surface mine, the lavender plants grew, and 16 veterans and former coal miners went to work. “They’ve been up here working and learning all about lavender, and they’ve been in the labs learning how the oils are distilled and what happens after that,” Sawyer said. Sawyer says the goal is to bring revenue into West Virginia and create jobs, not just for laid off miners, but anyone affected by the decline of the coal industry. “Everybody who worked in this area in some form or fashion was associated with the mine, whether that be a truck driver who drove a coal truck, or the local restaurants they ate at. When one is hit with unemployment, it affects many, many people,” Sawyer said. It is a long process. Lavender plants take about three years to develop so that they can be made into oils, medicines and cosmetics. Click here to visit the Green Mining Model Business Program.